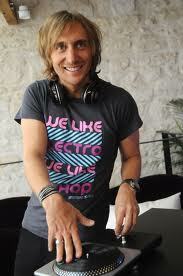 David Guetta was born on November 7, 1967 in Paris, France. His father is of Jewish-Morrocan descent and his mother is of Belgian heritage. Guetta grew up in Paris well off, supported by his father's work as a restauranteur. He began mixing vinyls at 13, and, after some practice, began having parties in his basement. At 17, he took his DJing skills professional, working at clubs all around Paris. Guetta then began to develop his own style. His influences at the time were many, as house music was really beginning to take off. House music is a genre that originated in Chicago and is typified by up-tempo beat and repetitive hook. Synthesizers are often used in production, but live instruments are employed as well. Also, while vocals are sometimes on house records, it is not strange for house songs to be purely instrumental. In particular, Guetta sites Farley "Jackmaster" Funk as his introduction to house after hearing one of his songs on the radio. Hip-hop has worked its way into Guetta's production as well, and today he features hip-hop artists heavily on many of his songs. Guetta's popularity rose significantly throughout the 2000's. He released a few singles that charted in France and gained more and more recognition with almost every release. In 2007 he released a song called "Love is Gone" that reached number one on the American dance charts. However, his biggest success came in 2009. It was then that he did the production for the Black Eyed Peas' number one hit "I Gotta Feeling". The song set a record for digital downloads in the US and had great popularity internationally. Guetta now has settled into his own as one of the top DJ's and producers in the world. In 2011 he was voted as the number one DJ in the world in a fan's poll for the magazine DJ Mag. He has also won two Grammy's. 1. What about your musician's sound do you like? How does the sound affect your mood? What does the song remind you of? I like the change of tempo he uses in his songs. His ability to know just the right moment for a shift gives his sound a unity and flow. His style is also, in general, upbeat. So, when I listen to him, it makes me feel more energized and active. This song in particular reminds me of just letting go and relaxing. 2. How does your musician's music reflect his or her time period? Was there anything happening in the world or music industry that influenced the music or sound? Guetta has a very modern sound. His use of synthesizers and other electrical instruments distinguish that much. Thus, his sound carries some of the early 2000's late 1990's dance club feel to it, as that is his genre. Undoubtedly, he was heavily influenced by the house music movement that was popular when he was developing as a musician. 3. If your musician does not sing, how can you interpret the music or sound? I interpret him simply through his up-tempo and foot-tapping sound. That type of music, with its pulsating beats and catchy tune elicits an energized response and tries hard to do so. Guetta's main goal in making music is to help others have a good time and let loose.